Frozen (film) Animated feature. Fearless optimist, the Princess Anna, sets off on an epic journey—teaming up with rugged mountain man, Kristoff, and his loyal reindeer Sven—to find her sister Elsa, whose icy powers have trapped the kingdom of Arendelle in eternal winter. Encountering Everest-like conditions, mystical trolls, and a hilarious snowman named Olaf, Anna and Kristoff battle the elements in a race to save the kingdom. Directed by Chris Buck and Jennifer Lee. Released in 3D on November 27, 2013, after a November 20 release in Paris, France, and at the El Capitan Teater in Hollywood. 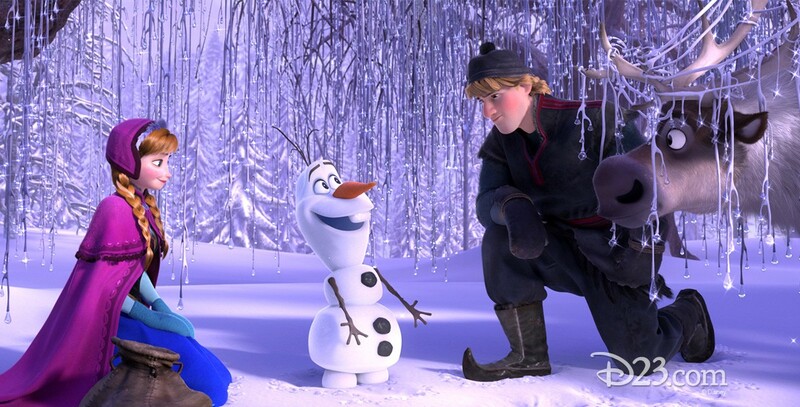 Voices include Kristen Bell (Anna), Jonathan Groff (Kristoff), Idina Menzel (Elsa), Josh Gad (Olaf), Santino Fontana (Hans), Alan Tudyk (Duke of Weselton). 102 min. From Walt Disney Animation Studios. During the initial release, on January 31, 2014, a special sing-along engagement began in more than 2,000 theaters. It received Academy Awards for Animated Feature and Song “Let It Go.” In March, Frozen became the highest-grossing animated feature of all time, passing a billion dollars internationally.